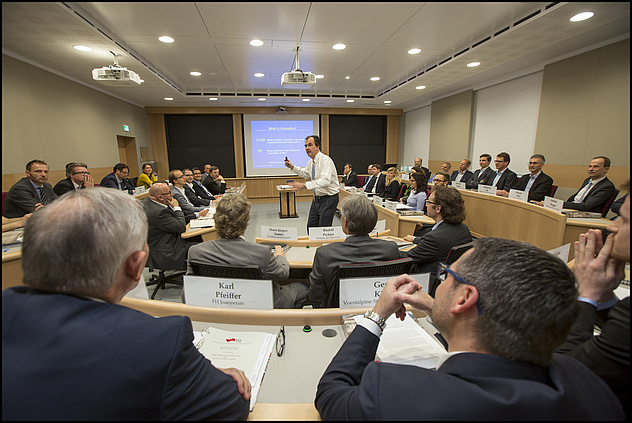 The IIM seminar fulfils all requirements for a case study seminar room based on the 100 year experience at Harvard Business School. During his post-doc as a visiting scholar at the HBS between 1997 and 1999, Prof. Christian Ramsauer experienced the power of the Case Study Method in business education. Encouraged by HBS Prof. Stefan H. Thomke, Prof. Ramsauer introduced the case study as the main teaching method when he became professor at the Institute of Innovation and Industrial Management (IIM). In 2013, Harald Kainz, rector of TU Graz, launched the implementation of the IIM seminar room, which was funded by Graz University of Technology, the Technology & Society Forum and the IIM. Referring to Prof. Thomke, "spatial organization and special appearance of a room make half of the success of the teaching method. Teaching time in the classroom should be characterized by an atmosphere that can be translated directly into real life." 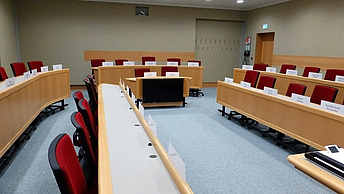 To meet the requirements for having a great learning experience, the IIM Seminar Room is designed in a U-shape that supports open communication. The seating rows are graded in height and enable every contributor to take up a representative place what is necessary for an emancipated discussion. Further, the spatial design ensures that every party has the same grade of overview of the whole room. Physical properties for good acoustics and high tech equipment as a video conference installation or a air conditioning system adapt the room to the contemporary state of the art. The Case Study Method is a form of instructor-guided, discussion-based learning. It introduces complex and often ambiguous real-world scenarios into the classroom, typically with a protagonist facing an important decision. Receiving a document that describes a specific problem, real managers once had to face, students act as co-creators of the learning process. Students prepare the case in advance, first individually, and then in small groups of three to five, to then participate as contributors and as listeners in an 80 minutes class discussion. The Case Study Method was introduced at the Law School of the Harvard University in 1870. The Business School followed 50 years later. Nowadays the HBS is the world’s largest publisher of case studies, selling them all over the globe. By practicing case studies, the students advance their own learning and that of their classmates. Ideally, learning should continue after class as students reflect on the discussion and apply insights and lessons in the broader context of their academic, professional, and personal lives. 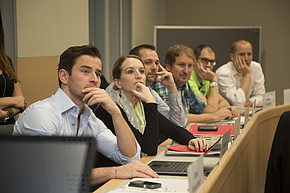 Der IIM Seminarraum ist eigens nach Anforderungen gestaltet, welche die Lehre und Anwendung der Harvard Case Study Method ermöglichen. Hierbei handelt es sich um eine Form der Lehre, die weitestgehend auf angeleiteter Diskussion basiert. Mittels Problemstellungen, die dem echten Leben entnommen sind, werden die Teilnehmer dazu animiert, gemeinsam auf Ergebnisse hinzuarbeiten und daraus zu lernen. Der IIM Seminarraum wird auch für externe Besucher - wie etwa Unternehmen - zur Miete angeboten. 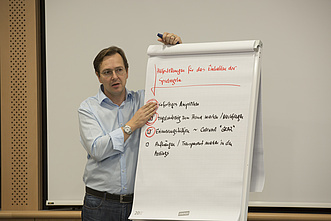 Neben der Nutzung für Workshops, Teambuildings, Executive Education oder sonstige Trainings ist auch die Möglichkeit für selbst organisierte Meetings gegeben. Weiters bietet das IIM individualisierte Case Studies für Unternehmen an.